When I started working with polymer clay I was at a total loss when it came to combining colors to make a beautiful whole. Although I had taken many art classes in school I wasn’t able to transfer what I’d learned about color to polymer clay. It was only by taking many, many polymer classes having a strong emphasis on color that I developed the ability to use color effectively in my own work. Most polymer clay classes are focused on technique, on how you manipulate the clay. The typical class supply list asks you to bring “clay in your favorite colors” or something similar. If your piece isn’t successful because of the colors you used, there is often not enough time to discuss what you might have done differently with the teacher. Even if there is time, you may be unable to fully appreciate what the teacher is telling you if you don’t know the language of color. Understanding how to work with color is one of the surest ways to add beauty and impact to your art. Nevertheless, many students shy away from classes focused on color, thinking somehow they will figure that part out on their own. There are a few people who do seem to have an innate ability to choose the right color combinations instinctively; I’m not one of them. When I started working with polymer, I could sense that my colors weren’t “working” but I had no idea how to fix the problem. At one point I became so frustrated I stopped working with color for 6 months, using only black, white and navy blue so I could focus on caning technique without being distracted by color combinations that weren’t working. In this post, will tell you two things that did not work for me: Building a library of color recipes and working with palettes such as those below. In the original images (above), it is the variations in hues that evoke my emotional response to the images. It is this emotional response that inspires me to create art. In the image on the left, Spring Orchard, by Philip Craig, there are not just the one or two purples captured in the palette, there are an infinity of purples. Some are redder, some are bluer; some are brighter, some are duller; some are lighter and some are darker. It is these variations that create the richness of the image, for me. The image on the right is much simpler, color wise, however; the same limitation applies. There is not just the one blue as shown in adjoining palette. Even if you were to mix that blue with white or black to obtain a wider range of light and dark values, it wouldn’t begin to capture the the subtle blue-greens and greenish-greys, or the deep, dark-blue in the tail. 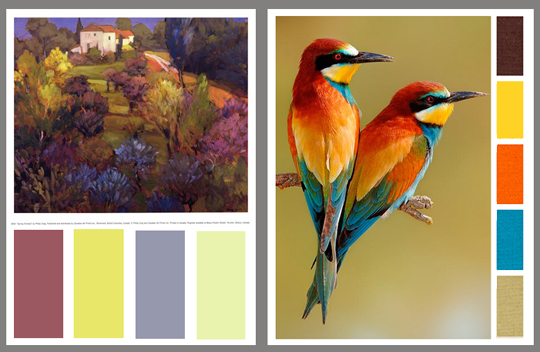 While these palettes might be very useful to architects, interior decorators, or clothing designers, they have not helped me get better at creating the beauty I want in my art. I am much better off working from the original images. 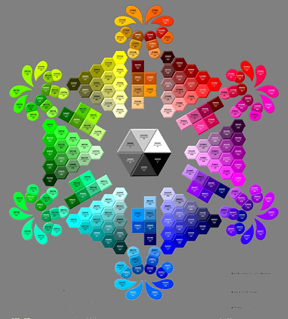 Similarly, color recipes may be useful to some but not to me, as I seldom want the exact same color twice. Furthermore they tell me nothing about how to put the colors together. This post is becoming too long; in a future post I’ll share some things that have been useful to me. Do come back! This entry was posted in Caning, Color, color mixing, color theory, Sources of Inspiration, Understanding. Bookmark the permalink. As an artist, I find that color theory is great for class work, but in the process of creativity…nothing beats the tried-and-true process of hands-on learning. Thanks so much for sharing your lessons-learned on color and polymer clay. It’s not a simple ‘dab will do ya’ kind of process. I think I find polymer clay is a blend of strategy and surprise. I’m always surprised as what happens…even if it wasn’t what I planned. Thanks again Carol! Just adore your work and insights. I agree that there is so much more than “a little dab will do you.” Paying attention to your personal response to color, practice at mixing and combining colors, exposure to different ways of using color, experimentation, critiquing other artist’s (and your own) use of color, and learning about color theory through a “hands on” approach all help. I also agree about the element of surprise – I think that is what keeps me trying new color combinations. Thank you for your enthusiasm about the blog as well! I never know until the piece is finished. Then I can’t duplicate the same thing again. but that is the fun of polymer playing!! That element of surprise definitely adds to the fun. Thanks for your comment, Barb. As a colour ‘novice’ I greatly appreciate your thoughts. I am instinctively drawn to bright colours in life as if they speak to me but how to get that tp translate into my own work is a whole new challenge. Thanks for commenting, Sharon. it is not just a challenge but a never-ending journey. Thank you for this wonderful post. I am looking forward to the next. I understand your weather is dreadful…perfect for spending time in the studio. You are welcome laurie. I’m glad you liked it. Yes, the high today was 3 degrees. It is great studio weather… the only problem is driving back and forth. Paula, I think of you 2-3 times a week as I work on this. I’m actually still studying this right now and looking forward to sharing what I learn when I see you again. Thank you. Carol, i have take. Maggie’s class and did the PC 3 Cube pproject and your Kaleidoscope class.. Also our guild did the color mixes as a group project from Maggie and Lindley’s book. I know i can now mix any color(s) i want. Even with some range in the pearls. I do feel i fet lucky alot with what i end up with as pallets. Even so I feel there is so much more to learn especially when it come to muting pallets and keeping contrast . One thing that i have discovered for myself while extruding . Say with 3 primarys and either a mud ,translucent, gold or white as the color i put inbetween each primary . Is that the range of colors i end up with all go together. I then cut the extrusion up into a bunch of equal pieces and blend indiviually. I end up with a vast selection of samples that i can play with that all go together and can then i can mix to match the colors i want to use in a larger amount. I liken extrusions to skinner blendng in a linear form. I hope this makes sense. Thanks for the comments, Jan. Your extruder approach sounds interesting. I’ll have to try it! I use a clay sheet thickness for the circles to put in the extruder that is equal to the diameter of the single hole disc I am using. 1/8th inch hole. Where does the gorgeous colour chart at the top of the post come from? Did you make it out of clay? Sorry Abigail I can’t remember where that came from. It’s not clay though.